Camera shutters occasionally flit, and the big bull elephant that is the focus of our breathless attention delivers intermittent rumbles of pleasure before snapping off another branch as though it were nothing more than a cinnamon stick. Apart from that, it’s wonderfully silent. It’s the kind of silence only encountered in the heart of the bush. I left the city noise behind and hopped on a flight to Hoedspruit Airport. Two hours later, I was trundling along a mopane-fringed dirt road on my way to Sun Destinations’ new safari offering: Chacma Bush Camp. Chacma is situated in a quiet corner of the undulating 8,000ha Maseke Balule Game Reserve, and you get the feeling that its location wasn’t chosen by accident. At its rear, a rocky koppie (home to a troop of chacma baboons and the odd klipspringer) stands sentinel, while a waterhole in front of the camp attracts an array of wildlife daily, including members of the big five. In fact, it’s only the barely visible electric fence surrounding the camp that keeps the elephants from making themselves at home. 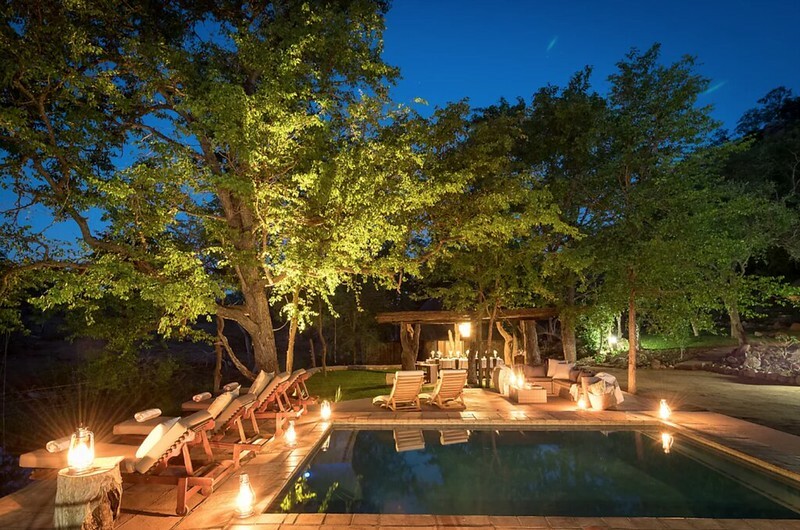 The outdoor area comprises a lovely lapa, a sparkling pool to cool off in and an inviting deck, complete with comfy sun loungers from which to keep an eye on the waterhole. Meanwhile, the boma is perfect for evening bonfires. Accommodation consists of three comfortable and unpretentious chalets of stone and thatch, which can sleep a maximum of 10 people. I have the Klipspringer Chalet to myself for the weekend and it doesn’t take long to fall asleep in a king-sized bed to the faint buzz of heavenly air con, far-off lion roars and the occasional jackal yelp. Roused by the 4:30am wake-up call, I treat myself to a refreshing outdoor shower; suffer a mild heart attack in a confrontation with a juvenile rock python outside my door; and finally, treading more warily, make my way down to the kitchen for a cup of coffee. ‘We’ll try and find the pride this morning,’ game ranger and co-camp-manager Calvin informs us over his coffee. ‘Six burly young males roam the reserve together. They made a buffalo kill the day before yesterday, so they should be getting hungry again.’ A touch bleary-eyed, but excited to see lions, we bundle into the safari cruiser around 5am and set off into the bush. Maseke’s borders are open to the Kruger National Park, which means there is no shortage of game. One can expect to see any of the big five, cheetah, wild dog, hyena and smaller predators such as civet, mongoose, genet, jackal and honey badger and, of course, an abundance of antelope. We had packed the binoculars – and a good thing too, as we would spot everything from herons, kingfishers and plovers to a variety of robins, chats and coucals over the following days. But Calvin’s early morning remarks have us fired up about lions and we’re bent on seeing the famous Maseke Males. 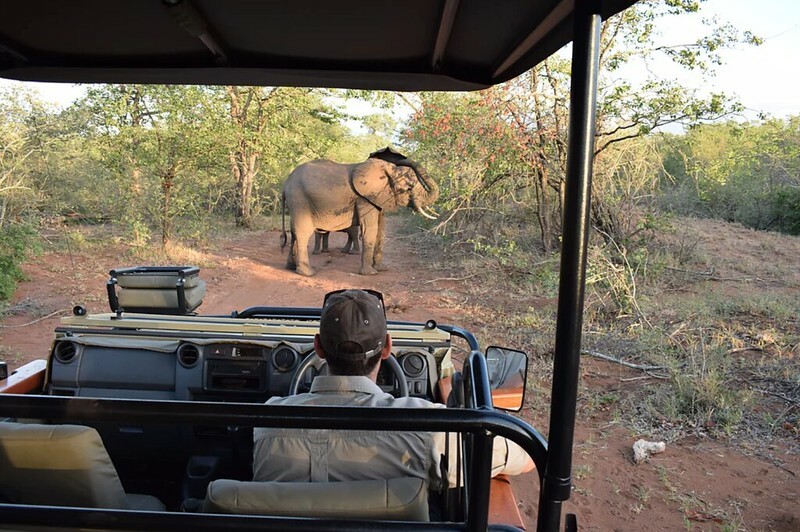 Alas, the bush rarely serves up what you have your heart set on, and it’s the elements of fortune and surprise that make game-drive sightings all the more special. Some days, you might see nothing but impala and a couple of hornbills, but the continued anticipation of potential rare sightings is what makes the three-hour drive worth it. That, and breathing the grassy, gamy bushveld air and soothing your city ears with golden Limpopo silence. Which brings me back to the massive elephant bull that came striding out of the thicket in front of the cruiser without paying us a moment’s heed, and started chewing on a breakfast of bark. We sit and admire it in absolute silence, and we’re close enough to make out every wrinkle on its criss-crossed hide, every chip and sap stain on its large tusks, and even the impossibly long lashes fringing its mud-brown eyes. Suddenly, the dextrous trunk snakes around a leafy limb like a python. The coils tighten and the thick mopane branch splinters without much resistance. We’re awed and fascinated by the show of strength and shudder to think what damage that hefty trunk might inflict on a fragile human body. But this elephant is as peaceful as it is powerful and, after having its fill of the tree directly alongside our vehicle, slowly sways further into the thicket, crashing and snacking its way towards the rest of its herd. We drive on. Later, the whole herd comes into view. Excitable two-week-olds with unruly trunks no thicker than hosepipes are gently admonished and patiently guided away from the cruiser by a team of old matriarchs. Teenagers prance around, showing off their superior trunk skills to the little ones by flinging logs about and blowing up dust clouds. We sit and enjoy the scene until the herd moves out of view. Calvin is still after the six lions but, after two hours without so much as a spoor, we decide a second coffee on the banks of the mighty Olifants River is in order. Calvin pours us each a cup from his thermos, which we enjoy with rusks. The river is in full flow and the rush of water over rock is suddenly pierced by the famous cry of a fish eagle. The big predator is perched on a branch on the far bank, and we get a good look at its impressive weaponry through the binos. The deadly talons are primed for a fishy breakfast, and we hope he swoops but, instead, he flies away upstream and out of sight. Back at camp, it’s an easy life. Our small group of journos spend the days swimming, reading and swapping travel tales. We eat like kings at the table under the lapa three times a day, and our wine glasses are rarely empty. Twice a day, we head out on a game drive in the hope of catching a glimpse of the Maseke Males, but to no avail. We do see plenty else, including white rhino, hippo and giraffe. On the last drive of our stay, Calvin and co-manager Michelle spoil us with a spread of snacks and sundowners and one of the most spectacular bush sunsets I’ve ever seen. We park at a viewpoint on one of the many koppies that dot Maseke. 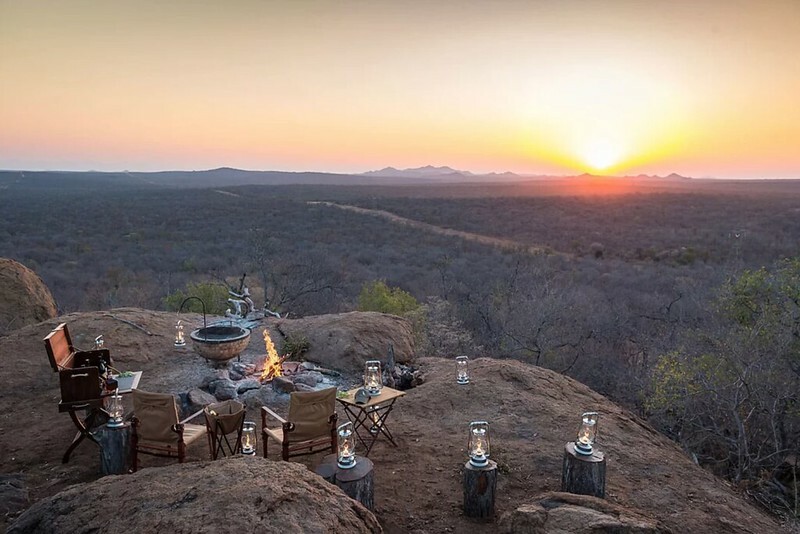 Far below us, a glassy waterhole reflects the citrus sky, and the lush summer bushveld sprawls beyond it as far as the eye can see. Finally, the sun sinks below the horizon in a dramatic show of reds and pinks, and we toast our gin-and-tonics to another tough day in Africa. – Make a reservation at Chacma Bush Camp through Sun Destinations at reservations@sundestinations.co.za or 021 712 5284. 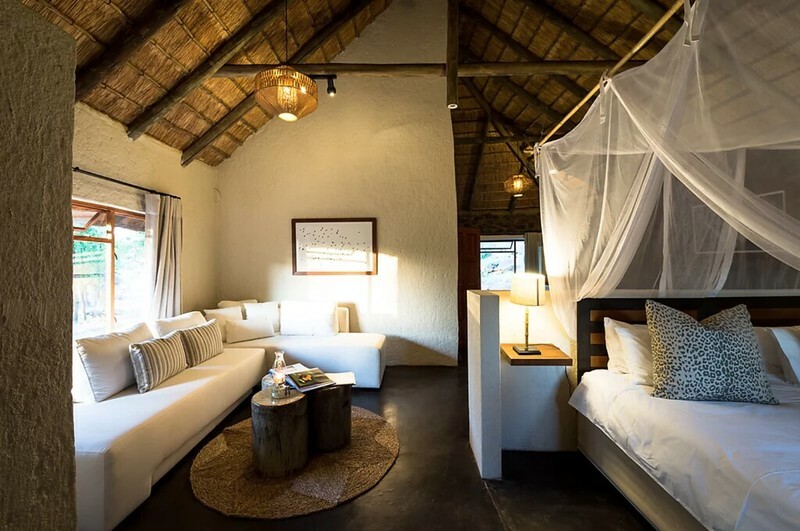 – The camp is located in the Maseke Balule Game Reserve in the Greater Kruger. The area is situated between Hoedpsruit and Phalaborwa in Limpopo. – Fly into Hoedspruit Airport (Eastgate Airport) and either self-drive or take a road transfer to camp. – It is roughly 50 km from the centre of Hoedspruit. – Driving from Joburg takes about six hours. Chacma is located at the entrance of the Lamai Gate, Maseke Balule Game Reserve, off the R40. Take the right turn at the sign that says ‘Grietjie’ and then you will see the Lamai Gate in front of you. It’s 4.2 km from the gate to camp. – Pack sturdy walking shoes, a hat, swimwear, and warm clothing for early-morning game drives. Richard Frederick Brown, the Roving Rogue, is primarily a travel writer whose work has been published in various online and print publications. He also serves as the editor of Escapes Magazine and as managing editor of Tech Magazine. His love for travel is unrivalled, and when he's in the bush he is at his happiest. ... He travels light, and lives roguishly.